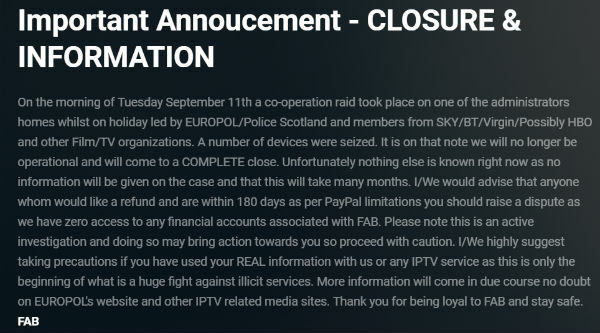 FAB IPTV, one of the major providers of unlicensed streaming content in the UK, says it has shut down completely following a Europol-led raid. The statement follows raids and arrests in both England and Southern Ireland last week. Europol previously indicated that a warrant had been executed in Scotland, where FAB IPTV is reportedly based, but is yet to confirm the news. Last week it became evident that a new crackdown against IPTV providers based in the UK and Southern Ireland was underway. In the first wave of action, a 41-year-old man and a 30-year-old woman were arrested in Bursledon, Hampshire, and detained under suspicion of offenses under the Copyright, Designs and Patents Act 1988 and money laundering. The pair were accused of illegally offering content from companies including Sky and BT Sport. Soon after, four more arrests were announced in Southern Ireland. Two men, aged 42 and 45, and two women, aged 37 and 40, were detained following house searches in Crumlin, Dublin and Ashbourne, Co Dublin. All were arrested and questioned under the Copyright and Related Rights Act 2000 and the Criminal Justice (Money Laundering and Terrorist Financing) Act 2010. Shortly after, a Europol statement said the arrests had taken place after a complex year-long investigation involving the Garda National Bureau of Criminal Investigation, Police Scotland, Trading Standards, the UK Intellectual Property Office, the Audiovisual Anti-Piracy Alliance (AAPA) and Federation Against Copyright Theft (FACT). The law enforcement agency also noted that a warrant had been executed in Scotland but provided no additional detail. 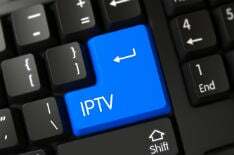 A statement just published on the official website of FAB IPTV, an IPTV provider known to operate from addresses in Scotland, appears to fill in the blanks. “On the morning of Tuesday September 11th a co-operation raid took place on one of the administrators homes whilst on holiday led by EUROPOL/Police Scotland and members from SKY/BT/Virgin/Possibly HBO and other Film/TV organizations. A number of devices were seized,” the statement reads. FAB IPTV was incorporated in Scotland under the name FAB Hosting Ltd on February 22, 2017. A notice for compulsory strike-off was published on May 15, 2018. On July 30, 2018, the company was dissolved after filing no accounts. The service continued to operate but during August its operators advised customers that it would eventually shut down. “Unfortunately we are no longer accepting new subscriptions or renewals of current subscriptions due to closure. Any active subs will be honored until expiry,” the announcement noted. With some of FAB’s customers having purchased subscriptions that are yet to expire, many are going to be out of pocket following the closure announcement. Equally, resellers of FAB’s service, who will have invested much greater sums, will also find themselves in the red. However, FAB indicates that funds could be reclaimed. “I/We would advise that anyone whom would like a refund and are within 180 days as per PayPal limitations you should raise a dispute as we have zero access to any financial accounts associated with FAB,” the statement reads. Whether former subscribers and resellers will choose to elevate their heads above the parapet will remain to be seen, but given what FAB has to say next, the option to cut their losses might be easiest for most. “Please note this is an active investigation and doing so [asking for a refund] may bring action towards you so proceed with caution,” FAB warns. “I/We highly suggest taking precautions if you have used your REAL information with us or any IPTV service as this is only the beginning of what is a huge fight against illicit services. More information will come in due course no doubt on EUROPOL’s website and other IPTV related media sites. Thank you for being loyal to FAB and stay safe,” the announcement concludes. While it’s simplicity itself to fill in fake details when signing up to a service like FAB, many people use their real identities. However, the operator of a similar service previously told TF that they never check if names and addresses are real, meaning that people can fill anything in with no consequences. Finally, it’s worth noting that at least as far as TF’s previous investigations revealed, FAB IPTV and its administrators were extremely easy to track down and identify. Quite why such services operate with such a low level of security and privacy isn’t immediately clear but now the perhaps inevitable costs will have to be counted.